Experience one of the superior airport hotels in San Francisco - the Millwood Inn & Suites. Experience personal service, fantastic features, top value and the perfect location San Francisco. Settle into our comfortable and spacious guestrooms and suites, exquisitely decorated with custom-designed furnishings, stylish décor and contemporary amenities. Pleasing pastel colors create a casual and cheerful in-room environment. You will enjoy the latest technology, along with the creature comforts of home, as you relax, unwind or conduct business as usual. 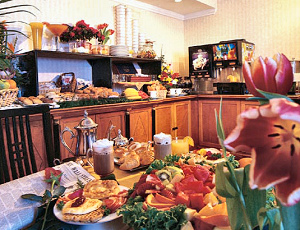 Start your day with a complimentary gourmet buffet breakfast of over 50 delicious menu items, including an assortment of eggs, breakfast burritos, pastries, breads, cereals, coffee/tea/cappuccino/hot chocolate, fresh fruit and juices.